Finally, a new way to pass the time at work: Office BINGO. Play alone or play with friends. Regular BINGO rules apply! PRINT A BINGO CARD NOW Most of the squares are self-explanatory, however, since we don't want any of your co-workers to cheat you out of victory, let's clarify what must be seen/heard to claim the box. ROW B Awkward Silence: Offices are loaded with it. Whether it's the lunchroom, the conference room or simply at your desk, you'll know it when you hear it! Community Food: Common examples are the obligatory bagels and birthday cake. Any edible item dumped on a public table for the vultures to consume qualifies. Fridge Cleaning: It doesn't happen often, but some do-gooder always posts a sign on the refrigerator door warning that all unmarked items will be tossed by 4pm on a given date. (Subsequently, this leads to people angrily marking their salad dressing bottles with bold initials.) 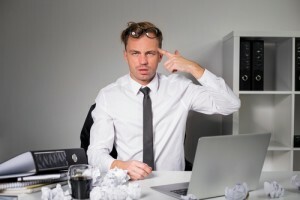 Popcorn Nuker: The smell wafts through the air, causing a … [Read more...] about Bored at Work? 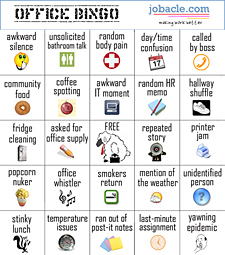 Play Office BINGO!